Stapleton Moms: Give your Child the Right Tools for Success in School and Life this Summer! Give your Child the Right Tools for Success in School and Life this Summer! Let me start by guessing you have already checked out your child’s school and teachers to make sure your son or daughter is in the best learning environment possible. You may think, I have my kids in great schools with great teachers and an awesome environment so I am good and my child is set up for success. If you are thinking that you may be WRONG! “Failure to prepare is preparing to fail”? Being called stupid, fat, loser, or worse year after year in elementary and middle school will slowly destroy your child’s self-worth. Low self esteem is the number one reason for poor behavior in teens and young adults. 1. 75% of teenagers with low self-esteem reported in engaging in negative activities like cutting, bullying, smoking, drinking, or disordered eating. – PR Newswire Association LLC. The main problem with this bullying issue is you and your child may not notice the effects until late middle or even high school. These effects, once noticed, will have gotten to a point that they will take years to fix if you can fix them at all. We as parents invest in child safety gates, corner covers, plug covers, car seats, healthy food, safe neighborhoods with better schools, great coaches, and the list goes on and on. Since we cannot bottle these traits up we have discovered the next best thing, Martial Arts training. Lack of self-esteem stems from a lack of belief in yourself. Saying things such as, "I am not good enough to accomplish anything," or "I have never won at anything." Professional Martial Arts instructors are highly trained to make sure your child feels great about everything they do in the program. In a good program the children will never be allowed to say “I can’t do this.” Each child is taught to say “Yes I can!” every time a challenge comes before them. This constantly reinforces the self-esteem of the students in the school. The second way Martial Arts improves a child’s self-esteem is by teaching them how to set and reach goals consistently. On their first day of training they will set the goal of achieving an orange belt. Martial Arts is an individual sport where each child is able to move at their own pace, which allows them to always reach their goals they set. This allows them to build years’ worth of faith in their abilities and themselves. The average time for a child to reach their first major goal in Martial Arts is 2 months, however, it may take a child 4-6 months based on their ability and focus level. This allows every child to overcome their own challenges and accomplish their own goals at their own pace. Making it possible for every student to build self-esteem on their own time. 1. To stand up to bullies. 2. To protect themselves against abusive words and physical attacks. 3. To communicate to parents, teachers, and their Martial Arts Instructors about their situation. Like I stated earlier, I wish I could bottle up self-esteem, but the reality is, you can’t! 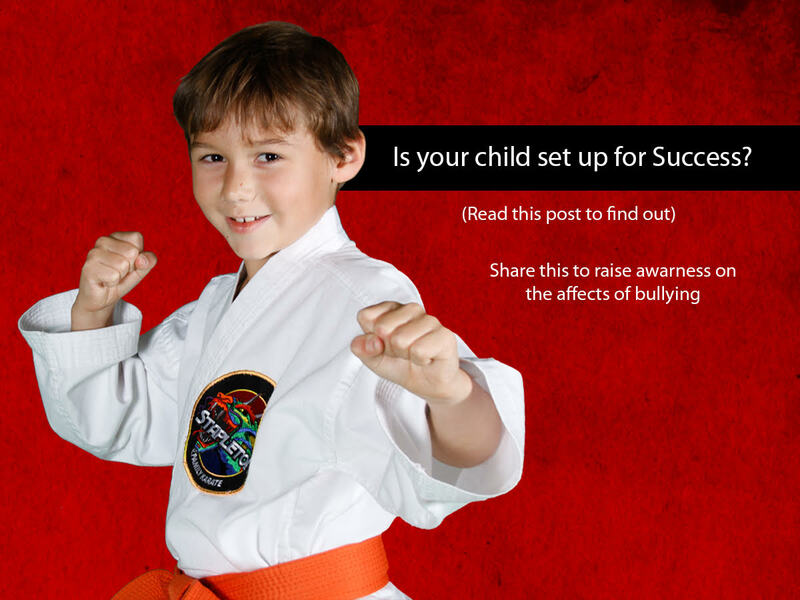 It will take years of Martial Arts training to fully develop self-esteem in your child. In a solid program the goal should always be to reach a black belt. A black belt in Martial Arts represents that child has built self-esteem and confidence to last a lifetime! In my personal experience, it took until I was a second-degree black belt until I felt I had the confidence and self-esteem to take me through my life. Not all Martial Arts Programs cover everything in this article. To ensure you enroll in a solid program in the Denver Area this summer contact Stapleton Family Karate directly at 303-928-0043 or email Hannah Carelly at hannahcarelly@stapletonfamilykarate.com. Stapleton Family Karate is offering your first month of classes for only ONLY $20! Use promo code “SUMMER” at http://kidslovemartialartsdenverco.com to get the $20 special. Micah Martin is the president and CEO of Venture Martial Arts and Stapleton Family Karate and a 3rd-degree black belt.